Live the magic of Hawaii as you begin a full-day drive and bike tour with a 2-hour narrated van ride to historical locations unique to Hawaii. The bike tour portion begins as you pedal the “Seven Mile Miracle” where the huge winter surfing waves pound exotic beaches. Visit the famous Turtle Beach and ride along old Haleiwa town. Enjoy a complimentary North Shore shrimp or vegetarian lunch. After the ride, an opportunity awaits you to choose an option to swim/snorkel at a quiet local beach. This amazing day is led by a knowledgeable local guide and includes hotel pickup and drop-off, bike and helmet rental. Meet your driver in your hotel lobby at 8:30am. Begin the day with a 2-hour van ride with narration to Kualoa Park's Dinosaur Mountain where films such as Jurassic Park, King Kong, 50 First Dates and many others have been brought to life. Here, you'll experience remote tropical territory on Oahu. Learn about island history and unique communities from your knowledgeable guide. Visit a Hawaiian fruit stand where you’ll get to savor enticing island fruits. 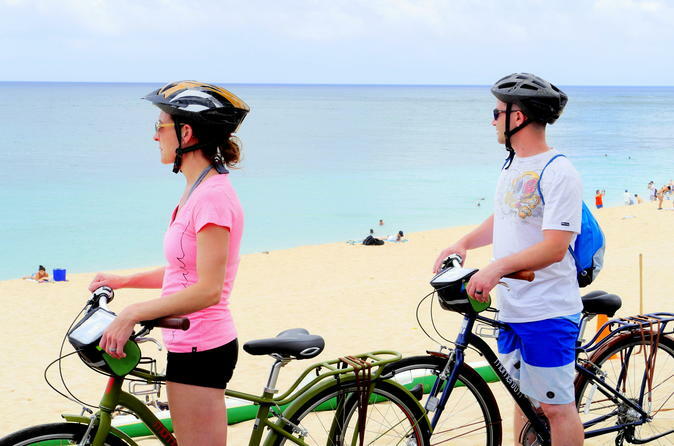 Your bicycling portion begins pedaling the “Seven Mile Miracle.” Visit the famous Turtle Beach and navigate through old Haleiwa town. Enjoy a complimentary North Shore Giovanni shrimp plate or vegetarian lunch. There's an optional swim/snorkel with turtles after the ride at a local beach park that comes equipped with outdoor showers and a changing facility.